My voice has sounded much more normal lately, and singing isn’t as difficult as it used to be. I graduated from the couch to a bed a couple of weeks ago, but forgot to write about it. 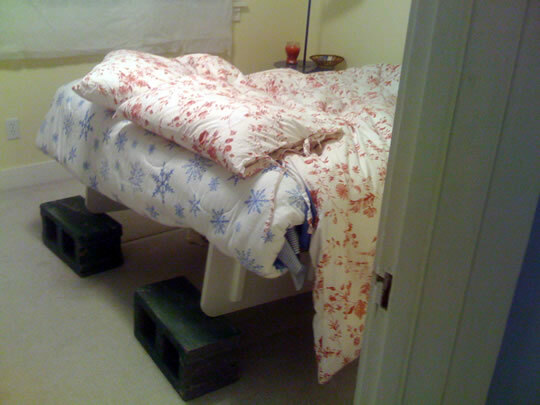 We prototyped Brad’s bed by propping up one end with cement blocks. (Those classy green blocks are from our Maryland days – the awesome brick & board bookshelves. We still have all the blocks and boards, and they’ve come in handy.) You’ll notice that it’s sloped toward the wall – that’s so I don’t fall off. When I was just sleeping on sheets I’d slide down about once an hour. There’s a flannel comforter under me now to provide some friction. It really works when I don’t shave my legs. he,he….you slid off the bed! You should paint a spinning sawblade or the entrance to hell on the wall your bed slopes toward. It could spark some pretty good dreams. HA! I laughed out loud at that! I’m glad your improving & getting better Lauren! Yay! Continue to be a good girl & follow the doctors orders. I wonder if sleeping flat will ever feel right to you again? Ha! It’s perfect. Hmmmmm, maybe it’s not perfect. I’m only thinking that because if it was perfect I would be thinking, “I should change the favicon to that.” And I’m not thinking that. I thought we couldn’t swear here. I like the thought bubble. Great job on the rest of the website, too! You’re my new best friend now.